Company Name: YIELD Co., Ltd.
At present, we are actively working to expand sales of Titanystar overseas. We plan to make them available in East and Southeast Asia, the Middle East, Europe, and North America. In addition, we have also been active as an equipment manufacturer. We plan to introduce our Aquabeam® combination ultrasonic/photocatalytic water purification system to markets in Japan and overseas. The Aquabeam system dramatically improves water purification performance via a mechanism that simultaneously aims both ultraviolet light and ultrasonic waves at the Titanystar surface. A Titanium Oxide Photocatalyst Based on a Proprietary Manufacturing Process. Direct Oxidation of Titanium Metal Produces a Strong Coating of Highly Active, Long-Lasting Photocatalyst. 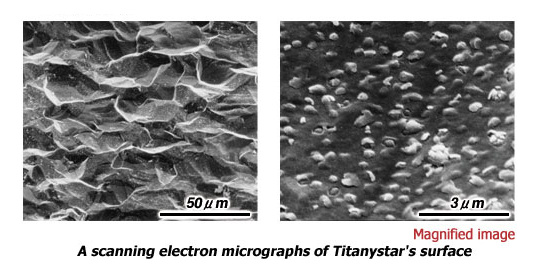 Titanystar is a highly active, long-lasting titanium oxide photocatalyst formed as a strong film with no interface boundary by directly oxidizing the surface of pure titanium metal. This photocatalyst material has the attractive appearance of titanium and the lightweight, tough, corrosion-resistant, and non-magnetic features of titanium metal. Its photocatalytic properties and aesthetic appearance can be imparted to home appliances or precision equipment products. light. These materials have a higher oxidation capacity than oxidizing agents such as ozone or chlorine, and can be used in many environmental cleanup applications based on the fact that they will continue to function as a photocatalyst as long as they are exposed to UV light. These photocatalysts, a technology originating in Japan, have won recognition around the world and their proven track record of successes has been growing. for purposes of antiseptic hygiene. In addition, we also have achieved significant results in consumer applications, and from these successes and results in public-sector institutions, Titanystar has been proven to have exceptional photocatalytic performance and high reliability. 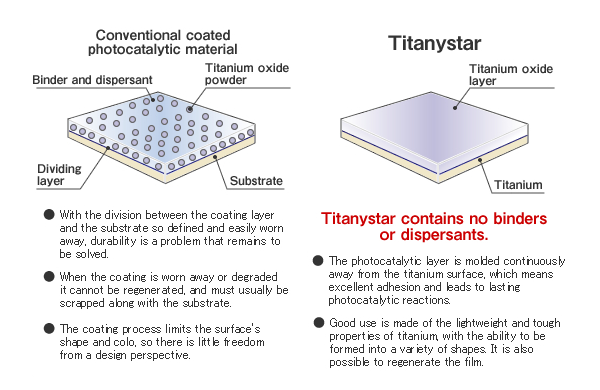 Titanystar is a highly active, long-lasting photocatalytic coating produced by forming a rugged, impurity-free film with no boundary interface on a pure titanium metal surface, the base material, by means of a treatment that directly oxidizes the surface of pure titanium metal. It combines the attractive appearance of pure titanium with the metallic properties of titanium such as light weight, toughness, corrosion resistance, and lack of magnetism. Although there is a cost involved for the required coating treatment when using photocatalysts in various environmental cleanup applications, Titanystar exhibits excellent photocatalytic performance for as long as it is irradiated by UV light. The photocatalyst market has been dominated by photocatalysts in which a titanium oxide constituent is made into a liquid aqueous solution and coated onto a surface. This type of coating has its drawbacks, such as the fact that the coating tends to be brittle and fragile and peels off easily, and also that the binder component becomes a factor inhibiting performance, with the result that the photocatalytic effect is less likely to be produced. 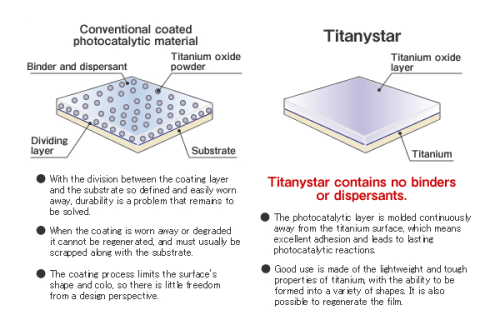 In contrast, Titanystar, our photocatalyst patented in Japan and the US, exhibits excellent photocatalytic oxidative decomposition and super-hydrophilic functions without damage to the coating even under harsh conditions, including airflow, water, heat, pressure, and pH. Titanystar’s surface has inherited much from the structure of the titanium material. A photocatalytic layer (of anatase-type crystal structure) is formed in this surface. “Photocatalyst Titanystar + UV lamp + Ultrasonic waves” -> Significantly improved its purification performance by overcoming the challenges of prior art. By combining conventional technologies, based on UV light irradiation onto Titanystar, with the ultrasonic technology to release very strong energy in water, the water-purification performance has improved dramatically and the treatment time has become significantly shorter. Specifically, UV light and ultrasonic waves are simultaneously irradiated onto the surface of the Titanystar photocatalyst, after which water to be treated is introduced for purification. The oxidation capacity of the photocatalyst is much higher than that of ozone, chlorine, etc., and can break down and remove nearly all harmful substances. This chemical-free catalyst does not use chlorine, hydrogen peroxide or other disinfectant, and it’s free of the carcinogenic property associated with ozone waste. Thus it ensures high water-purification performance in a safe manner. This water purifier developed in Japan uses an environmental purification material for the treatment mechanism. Shining ultraviolet light onto a titanium oxide photocatalytic surface causes reactive oxygen species to form. These come into contact with organic or harmful matter and detoxifies them by decomposition. For medical use, electronics, drinking water production system, spa/pool, aqua farming and purification of muddy water in rivers, streams and lakes.